Treating pneumonia the naturopathic way. Pneumonia is the 5th leading cause of death in Americans over the age of 65 according to the CDC. The common cold progressing into pneumonia in elderly patients is a very regular occurrence, thus prevention of the common cold and annual flu in turn means pneumonia prevention as well. Typical prevention practices are receiving flu and pneumococcal vaccinations. Other factors that increase the risk of pneumonia in elderly patients include: age, comorbity, COPD, residence in a nursing home, asthma, heart, liver or kidney failure. We have cold, flu, and pneumonia vaccines. If a cold is treated within the first 3 days it greatly decreases the chances of it developing into pneumonia. Preventative measures such as a comprehensive nutritional assessment being conducted on the patient, monitoring weight loss and utilizing probiotics should all be incorporated in preventing pneumonia progression. Our natural vaccines are updated every year and do not contain aluminum, methyl mercury, formaldehyde, super viruses or fetal monkey tissue. Our vaccine is about 89% effective compared to the flu shot at less than 40% and sometimes at 9%. Vaccinate against colds, flu and pneumonia. Second Nature patients continue their GOOD GUT probiotics + immune and Xymogen's ImmunotiX 500 daily. I.V. Ozone is quick, easy and kills the pathogens. I.V ozone is a safe and effective way to knock out infections. It is a great preventative measure to be taken as well. An ounce of prevention is worth a pound of cure. 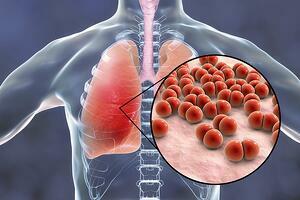 We have specific injectable remedies for the treatment of pneumonia and other lung conditions. Call us and order your flu, cold and pneumonia vaccines for everyone in the household. Naturopathic Medicine is primary care of today and future medicine of tomorrow.